It is of the Lord's mercies that we are not consumed, because his compassions fail not. 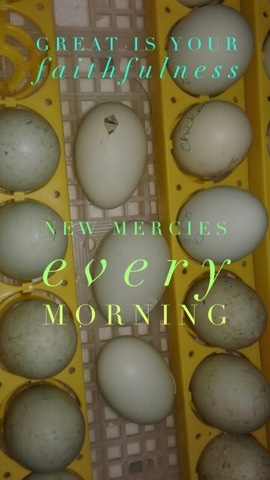 They are new every morning: great is your faithfulness. My sister is in the hospital. As I sat by her side I watched the numbers on the machine connected through so many wires to her body. She slept and started to heal. My kids texted me that three of the eggs they've been watching so closely in the incubator have tiny cracks and then they started to hear tiny chirps. New life emmerging! Friends have shared online about watching the birth of a baby giraffe. More new life. Winter here was so mild, bushes are blooming all around. As I drove to the hospital in Baton Rouge I passed beautiful azalea bushes filled with purple blooms then piles of Sheetrock and insulation still being torn out of buildings that were flooded. New beside old. I'm thankful for new mercies every morning. Great is his faithfulness! Sorry to read of your sister. Offering up a prayer on behalf of your sister...and one for you too. Praying for your sister. God is truly faithful though. Thank you for the reminder. Praying for your sister. So grateful for His love and mercy which break through each day! Blessings! I am so so grateful for new mercies every morning! I sure need it. Said a prayer for your sister. 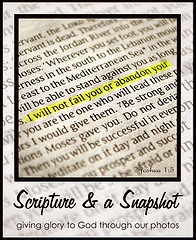 I'm here for the first time and love the idea of Scripture and a Snapshot because I love Scripture so much - and I love beautiful photos. Seems like a win-win. I started following your group Pinterest board. I'm Jerralea. One moment at a time, our Father is caring for us, giving strength and new life ... Praying for your sister, Jennifer. Praying for your sister's full recovery, and glad that you are receiving assurances of God's new mercies each day.